Update: New profile photo. Me in my studio, photo by Nancy Donskoj. 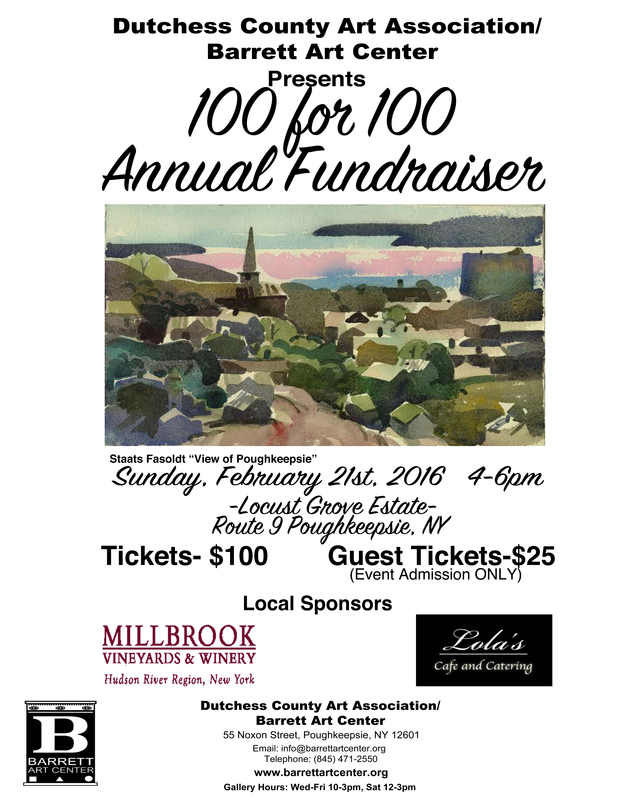 Update: This Sunday is a wonderful event for a good cause: a fundraiser to benefit Barrett Art Center, Poughkeepsie, where you may purchase lovely works of art by area artists. Details are below. 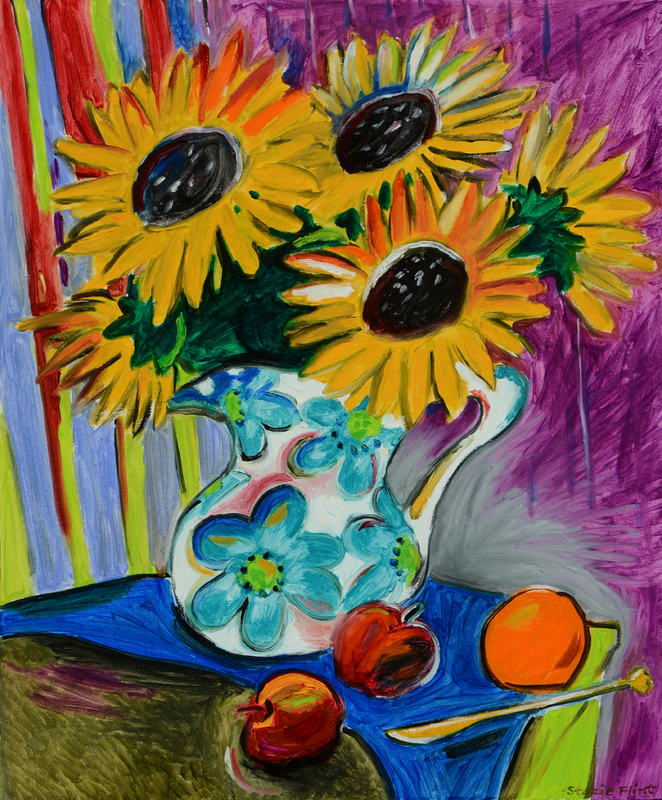 My sweet little oil "Sunflowers in a Vase" is available for you. -- BC Kitchen + Bar, College View Avenue, Poughkeepsie -- February 2 - March 14. Reception Wednesday March 2, 5:30-6:30pm. Stay for dinner! Sponsored by Barrett Art Center, Poughkeepsie. 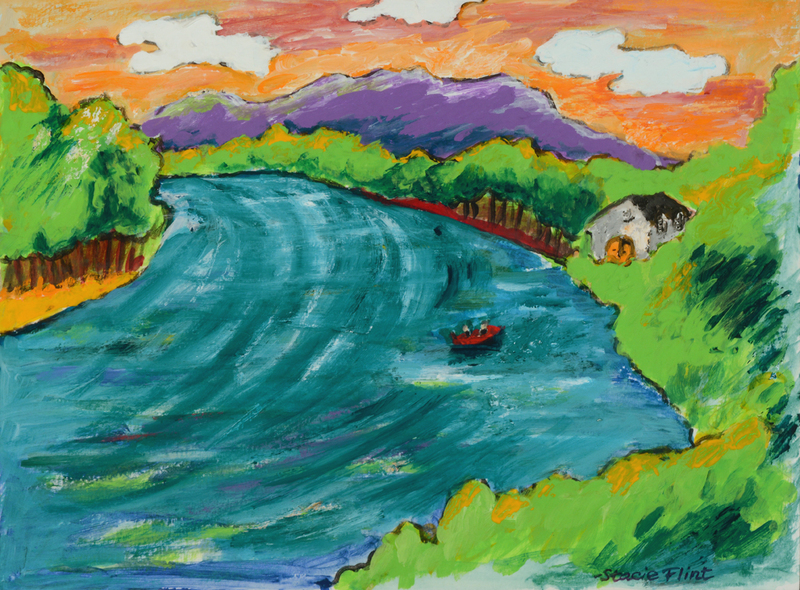 "At the Shore", 24"x30", in the BC Kitchen + Bar show. 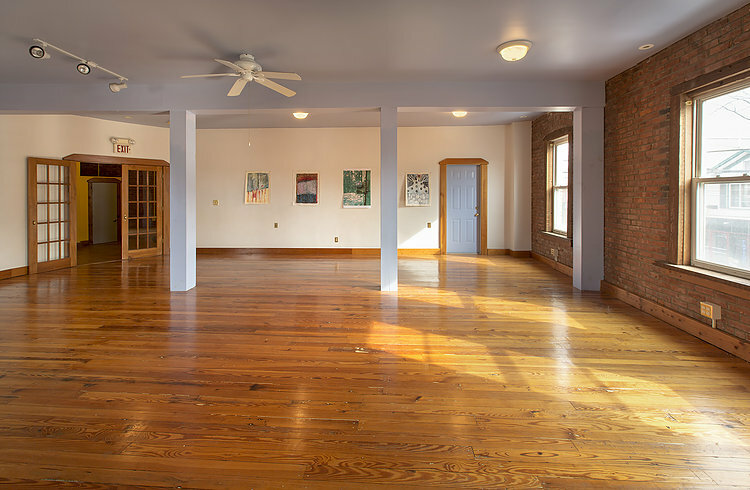 -- The Mid Hudson Heritage Center, 317 Main Street, Poughkeepsie. February 19-March 16. Opening Reception this Friday February 19, 6-9pm. 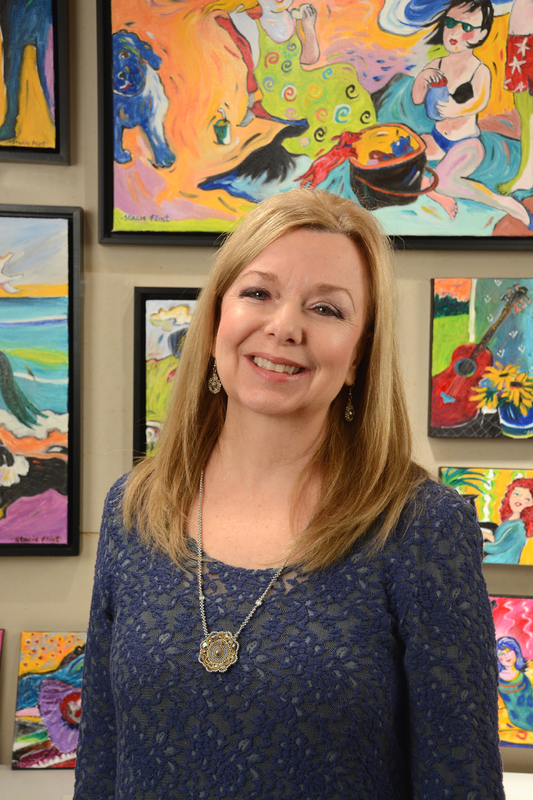 Update: Just had some new profile photos taken for my website www.stacieflint.com, and Facebook https://www.facebook.com/stacie.flint.9, by photographer Nancy Donskoj, including the one above of me in my studio. As always, please get in touch to inquire about prices, to buy a painting, for a studio visit, or if you would like to talk about a portrait commission. 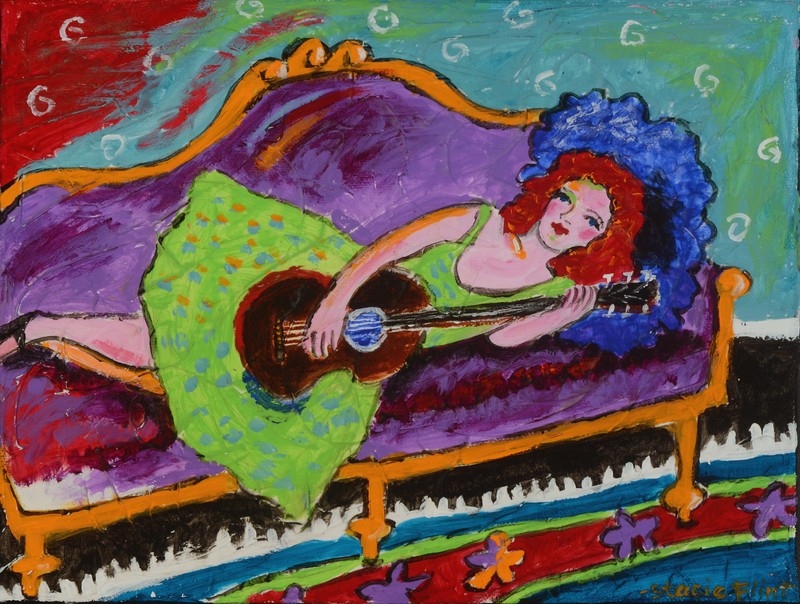 "Woman with Guitar on Red" acrylic, 20x24"; in ASK's "Red" show. 2016 is rolling along...wow -- it is February! I would like to let you know about a few shows that I am involved with. 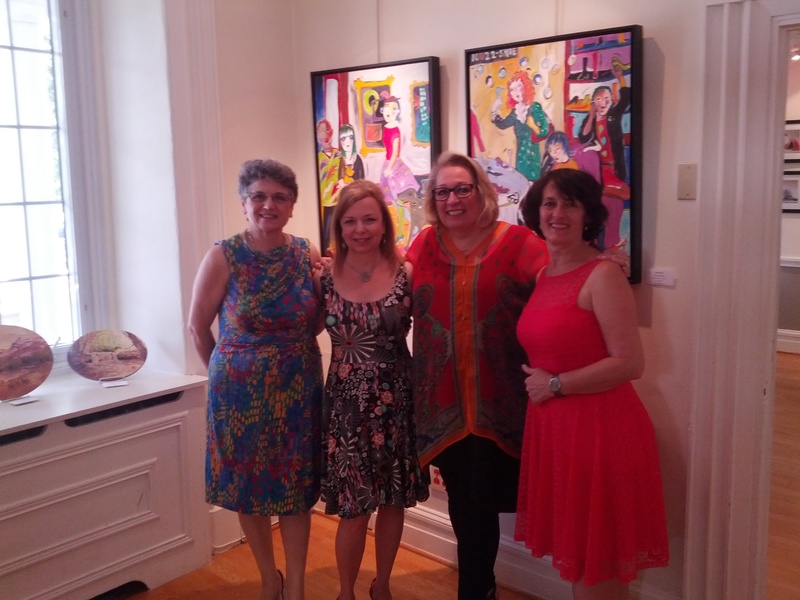 -- Arts Society of Kingston, 93 Broadway, Kingston - "Red" Exhibit. February 6 - 27. Opening Reception Saturday February 6, 5-8pm. www.askforarts.org. 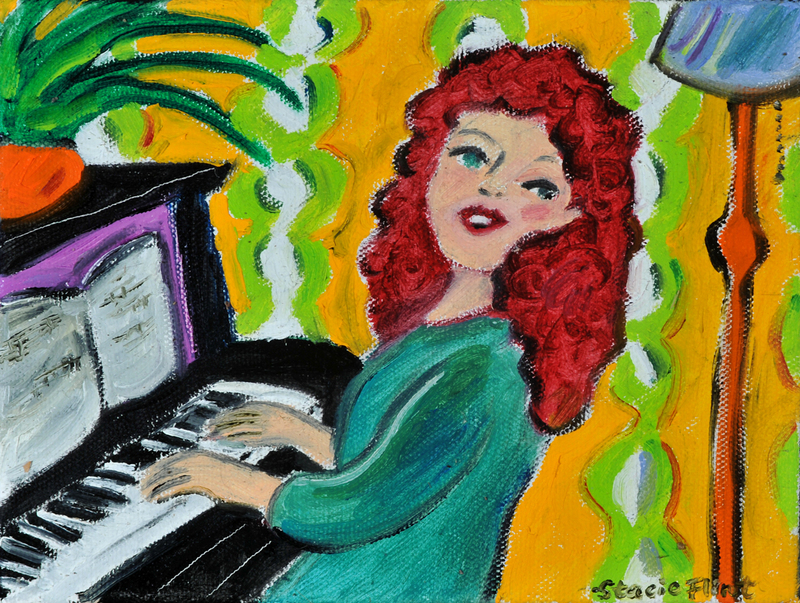 "Woman with Guitar on Red" (above) is in this show. 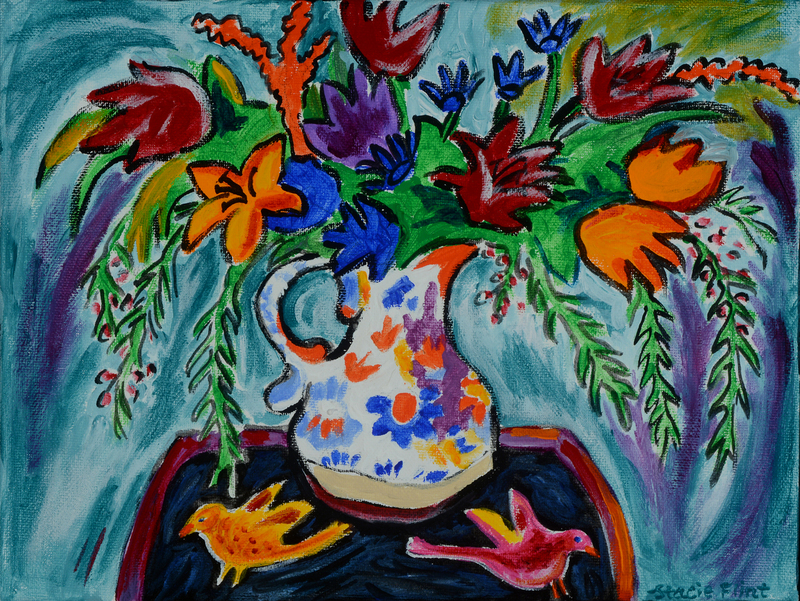 "Blue and Yellow Flowers", oil, 24x20", in the BC Kitchen + Bar show. 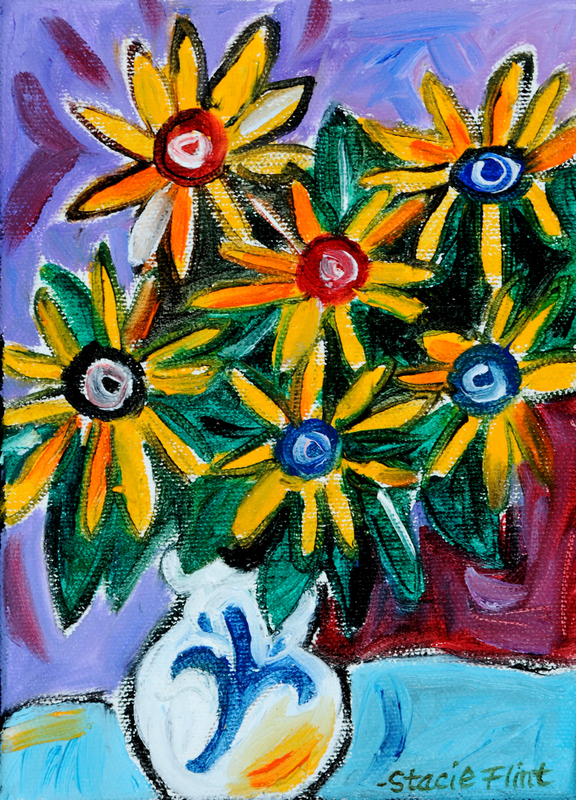 "Blue and Yellow Flowers" (above) is one among 18 pieces on view in this show. 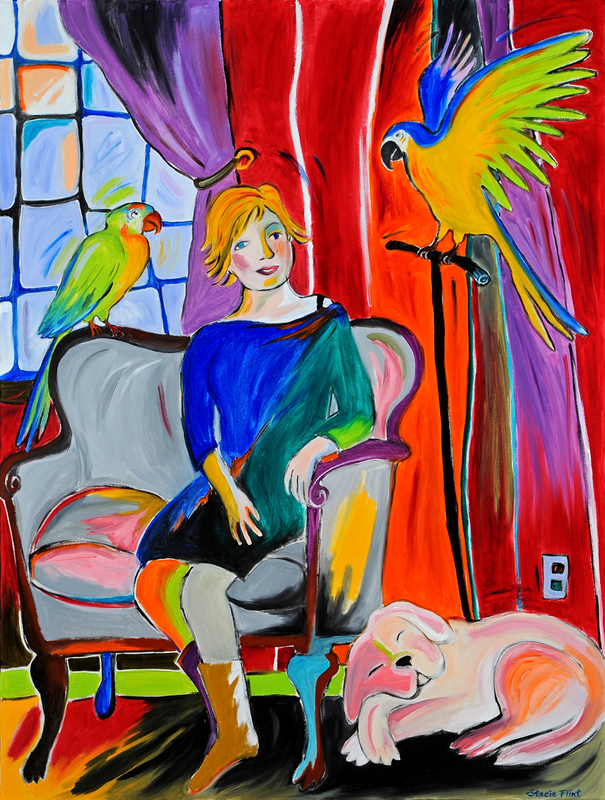 "Woman with Parrots and a Dog", oil, 48"x36", in the MHHC's "The Bird Show". 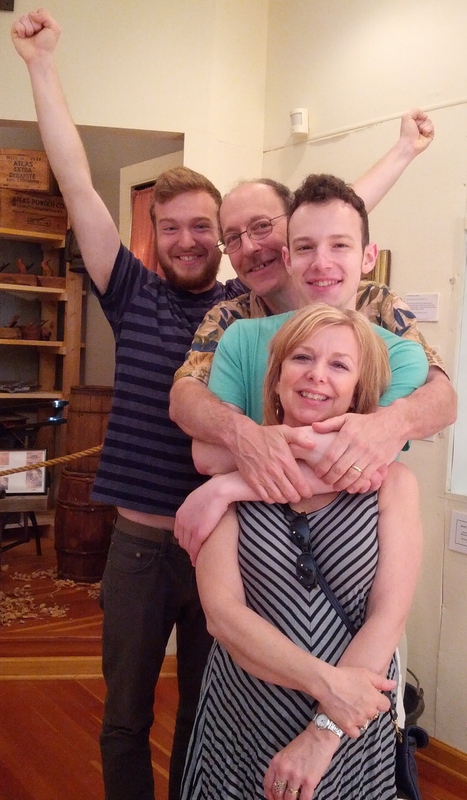 -- The Mid Hudson Heritage Center, 317 Main Street, Poughkeepsie. February 19-March 16. Opening Reception Friday February 19, 6-9pm. 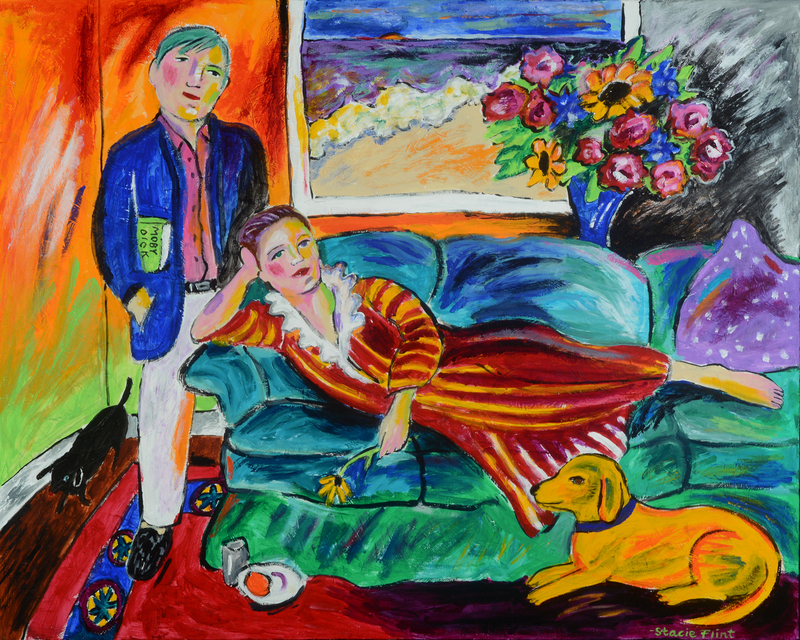 "Woman with Parrots and a Dog" (above) is in "The Birds Show" at MHHC. 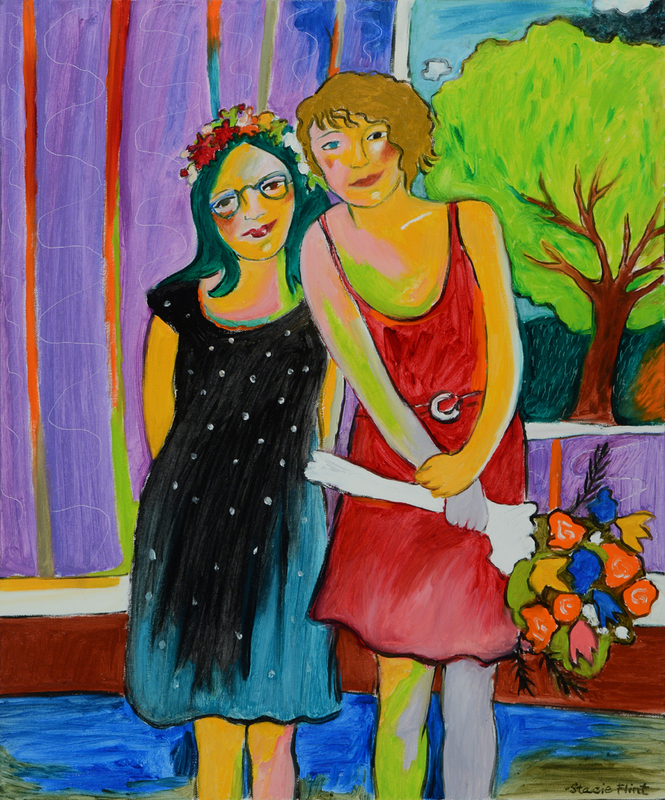 "Sisters", oil, 24"x20", in the "LongReach Arts 2" show at the Hudson Valley LGBTQ, Kingston. -- Hudson Valley LGBTQ, 300 Wall Street, Kingston. December 5-February 29. 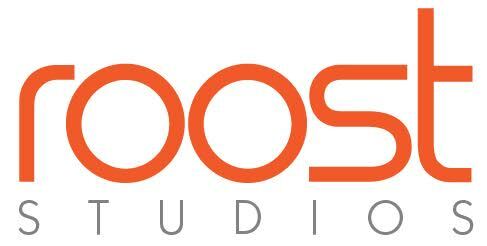 Hours: M-F 9-5. 845-331-5300. 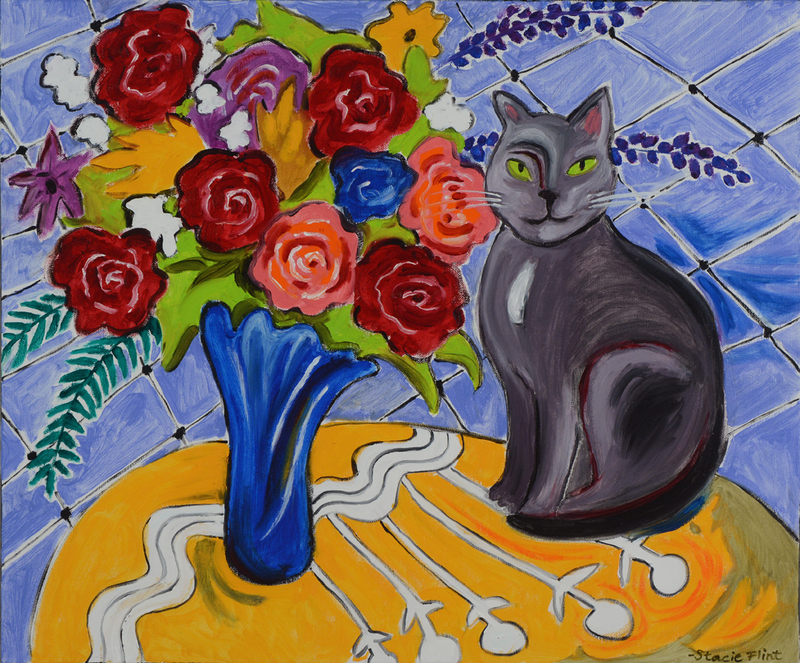 "Sisters" (above) and "Cat With Bouquet" are my two paintings in this show. February is a great time for art! 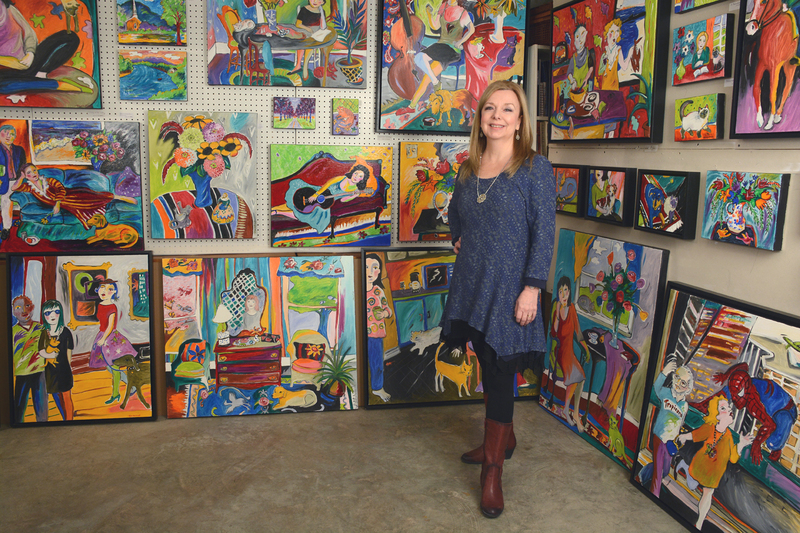 I feel blessed to live in such a vibrant art and cultural community of many talented artists, where there are people like you that love and acquire art! As always, please get in touch for a studio visit, or if you would like to talk about a portrait commission. Happy December! 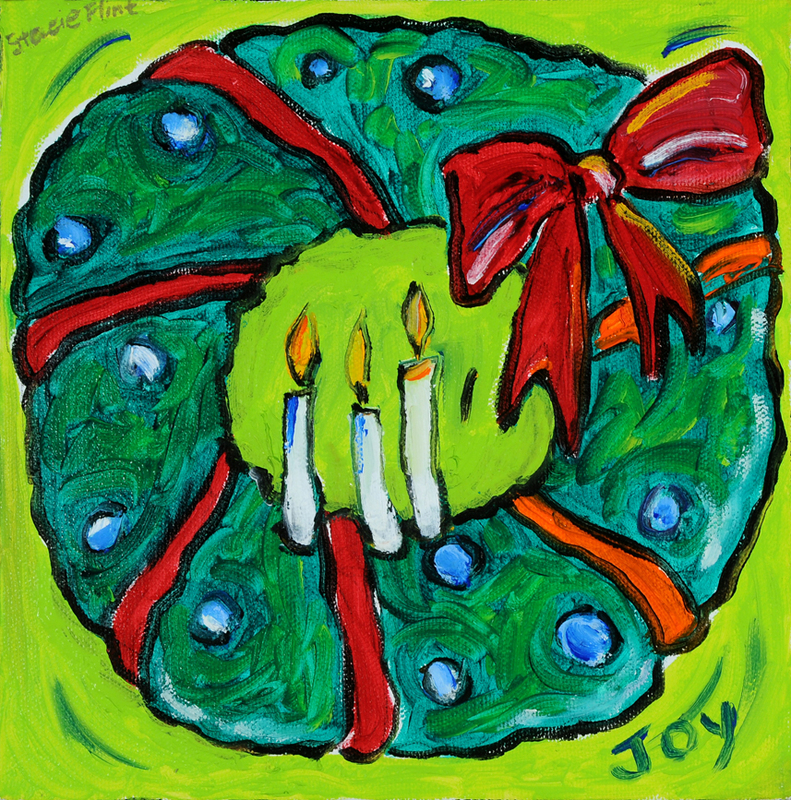 As we prepare for the Holiday Season, gift giving is one way to spread joy, and giving local original art is a lovely choice! I have been eagerly preparing for four group art shows that I want to tell you about -- four community events to share my art with you. If you have questions about anything, please ask! 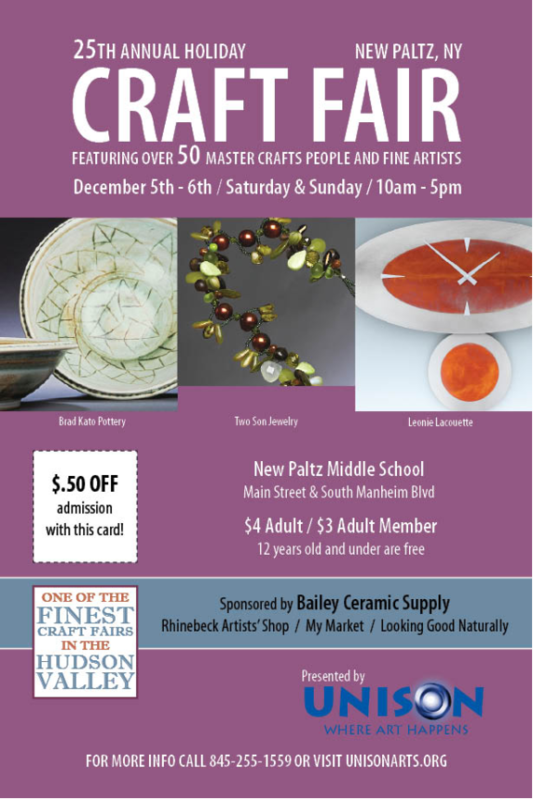 -- Unison Arts' 25th Annual Holiday Crafts Fair December 5-6, 10am-5pm. This show features gallery-quality handcrafted gift items: ceramics, jewelry, woodwork, wreaths, blown glass, photographs, and of course colorful paintings -- and much more, at affordable prices. This is a great opportunity to take care of your holiday gift list! For more information, including a list of exhibitors, visit unisonarts.org. 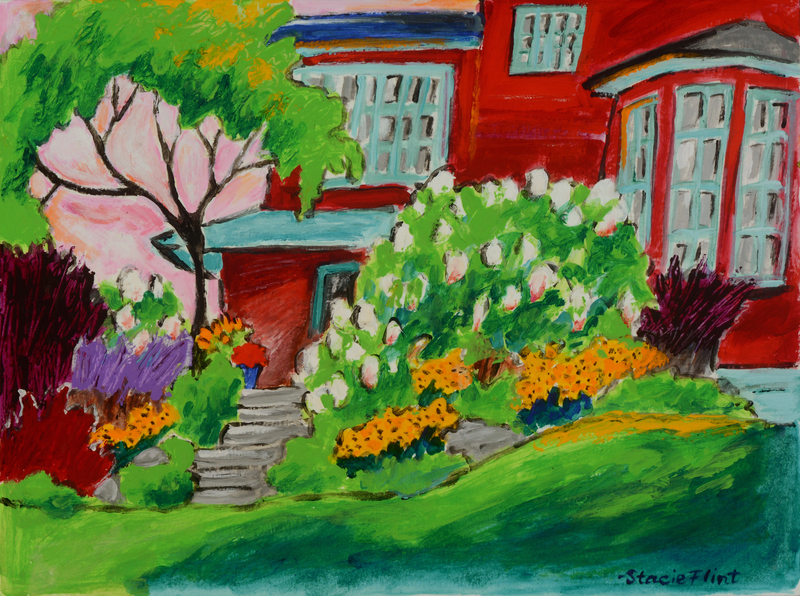 At my display, there are oil and acrylic paintings of women, pets, landscapes, and flowers; archival prints; childrens' book; greeting and holiday cards - some with fun new images! If you are not local, I am happy to ship to you or your gift recipients for the holidays! Please view the postcard below for more details and a $.50 discount on admission! 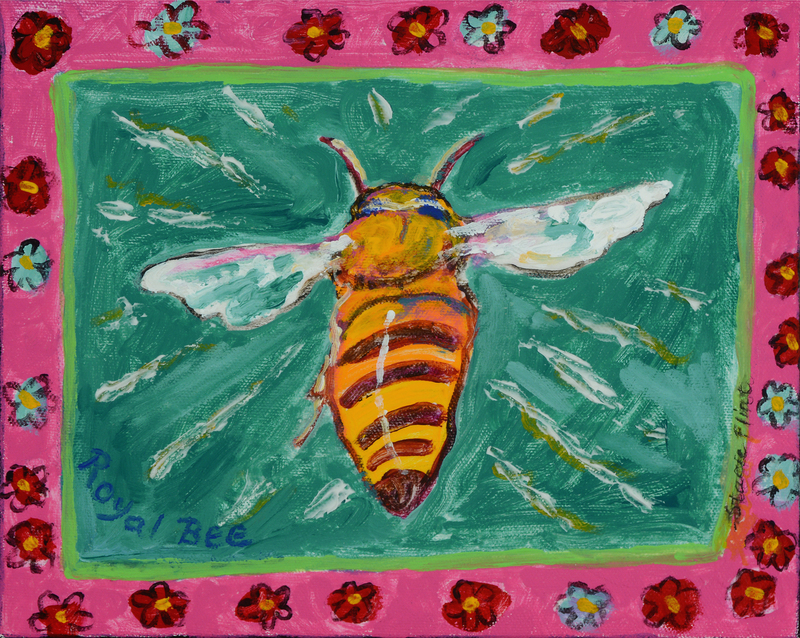 -- LongReach Arts 2 at LGBTQ, Reception Saturday December 5, 4-6pm. Details below that include an Artist Panel Discussion. (Since I will be at the Unison Fair until 5, I will try to attend the last half hour of this reception. However, I will not be able to attend the panel discussion.) My painting "Sisters" (oil, 24x20") is shown below and on the card and is one of the paintings included in the show. 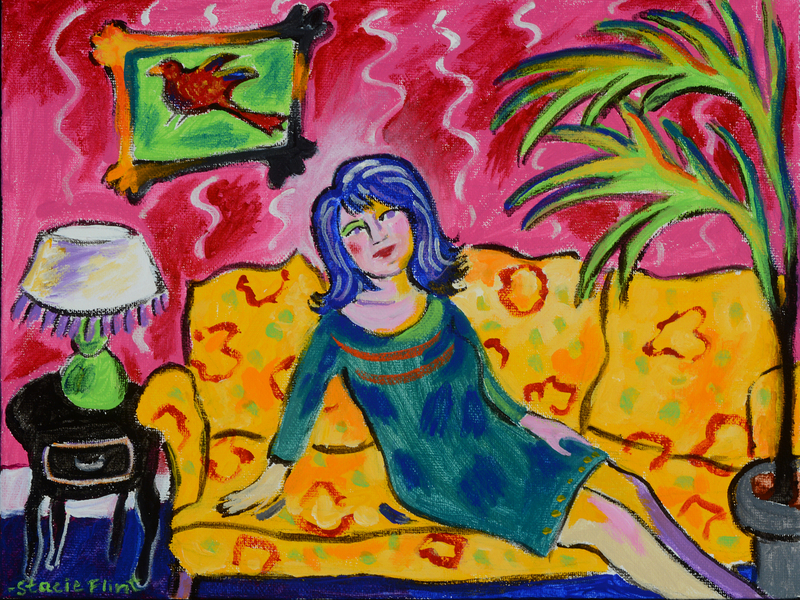 -- Unison Arts Holiday Art Showcase, 68 Mountain Rest Road, New Paltz, Opening Reception Dec. 13, 4-6pm. Runs till Jan. 3rd. It is new this year, for Unison Craft Show artists to show in the Unison Gallery after the Fair. 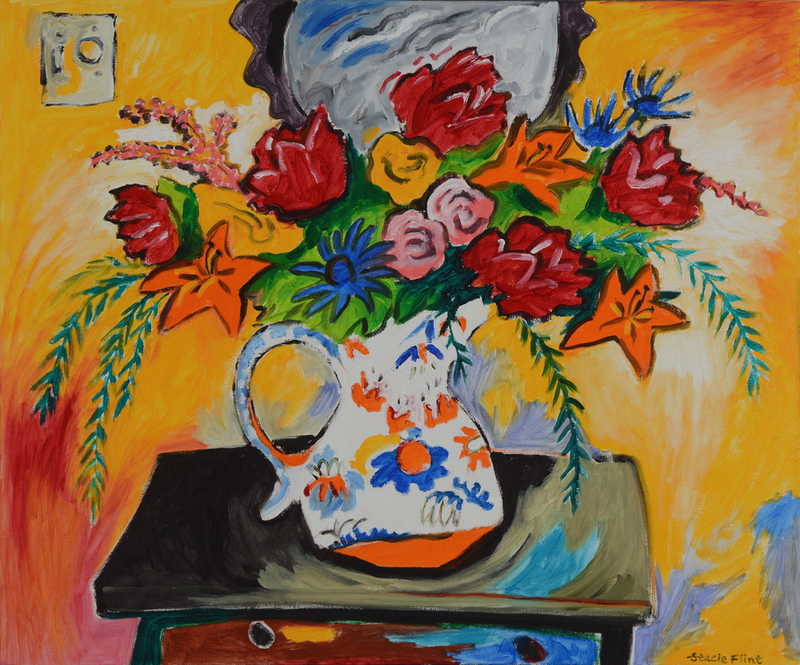 "Bouquet in an Antique Pitcher" is one of the paintings that will be in this show. -- Portrait Commissions: I always enjoy creating lively interpretations of special people, pets and objects in my clients lives, commissioned by them. 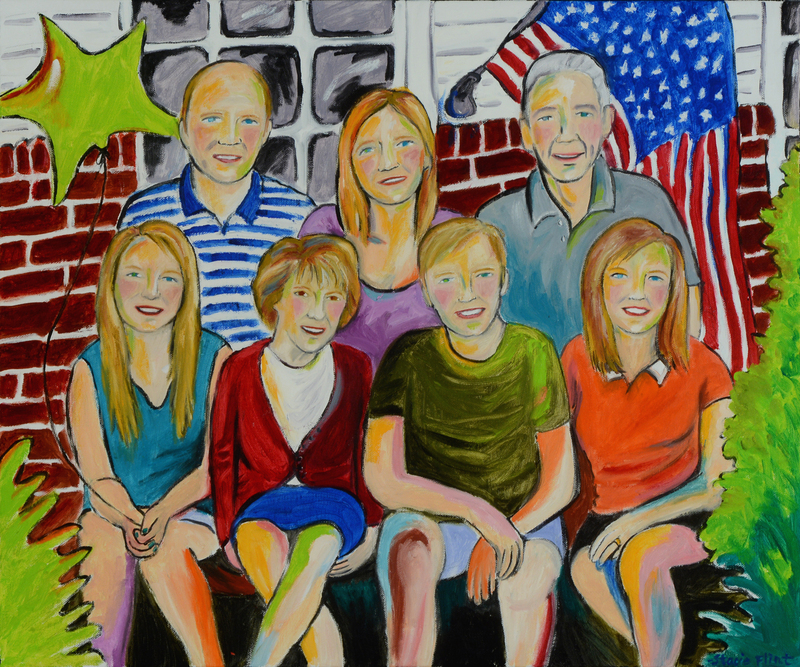 Here is a recent one called "The King Family Celebration on Hummel Road." One family member has a birthday on July 4, so the Kings enjoy get-togethers on that day for a double celebration! Thanks, and best wishes for a lovely holiday season! 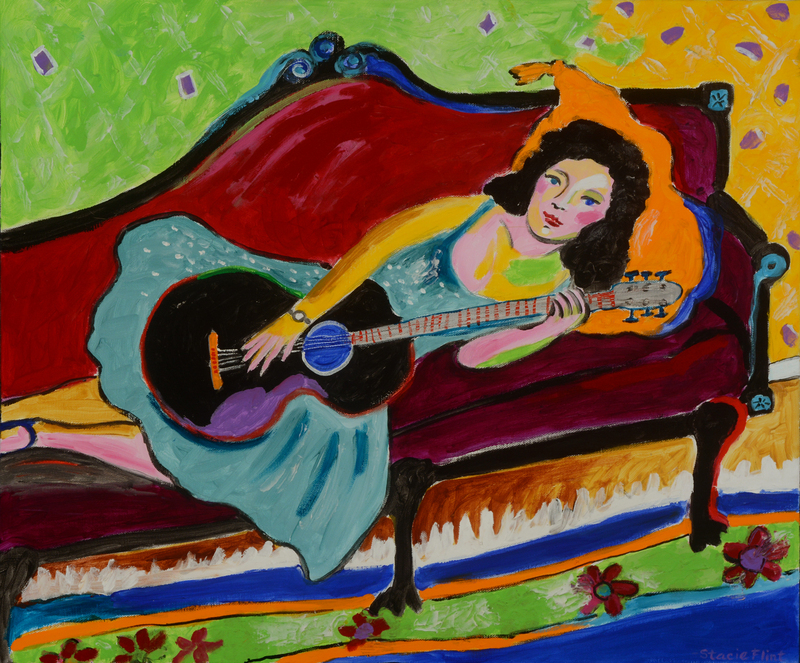 "Woman with Guitar on Red", 20x24"
This summer when I was in Canada's Richelieu River Valley region participating in the artist residency workshops, I enjoyed creating work in fresh ways to me. 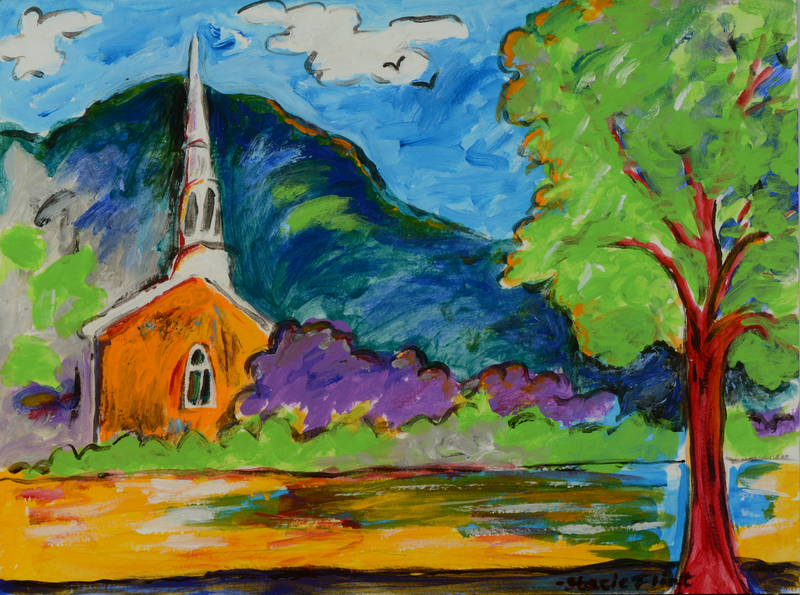 This includes using acrylic paint and modeling paste to build up surfaces for added texture (see "Woman with Guitar on Red" above), and painting the local landscape as seen in the two paintings below, "On the Richelieu River", 9x12" (left) and "Church near Mt. 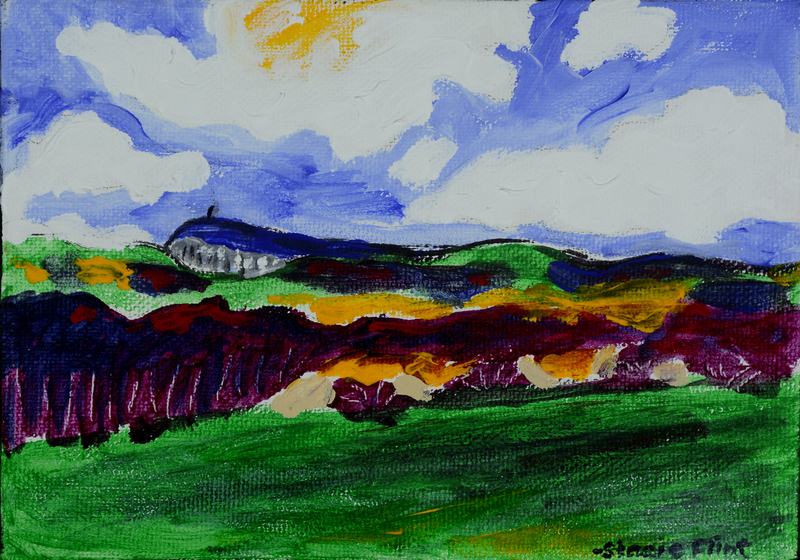 St. Hilaire", 9x12" (right). 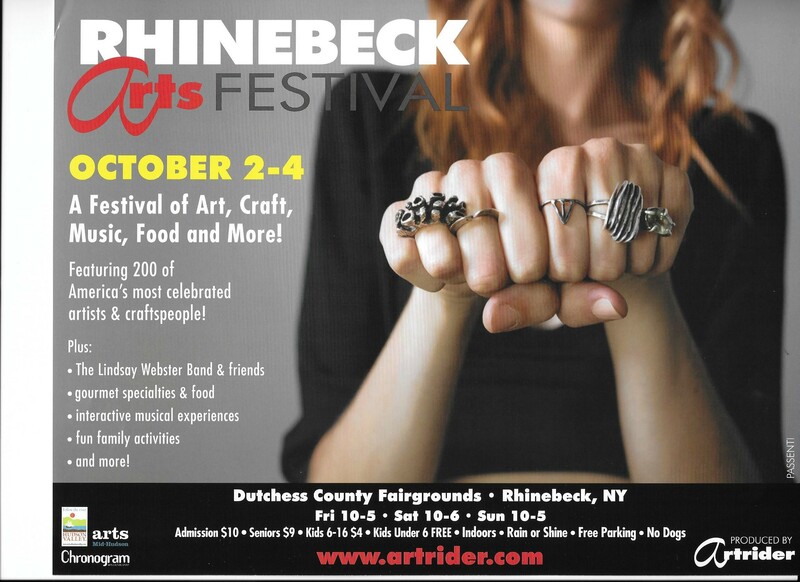 These and many more oil and acrylic paintings, prints, greeting cards, children's book and children's music cd's will be at my booth this Friday October 2, Saturday October 3, and Sunday October 4, at the Rhinebeck Arts Festival. Information is below for this fabulous show. Also enjoy a $1. discount! 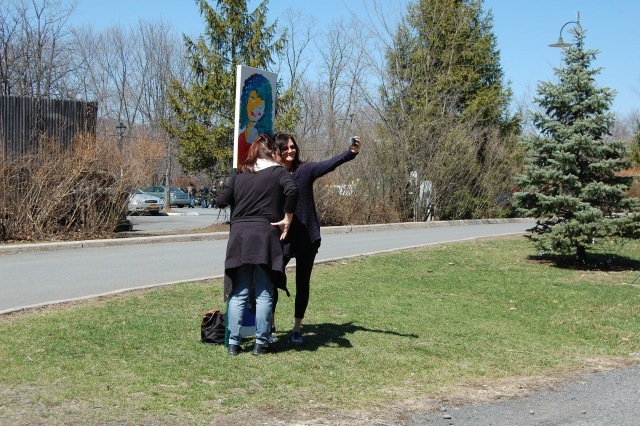 Remember this spring when those mysterious, exciting doors were installed around Gardiner and New Paltz? Then it was revealed that they were each uniquely created by the artists of the Gardiner Open Studio Tour (GOST). 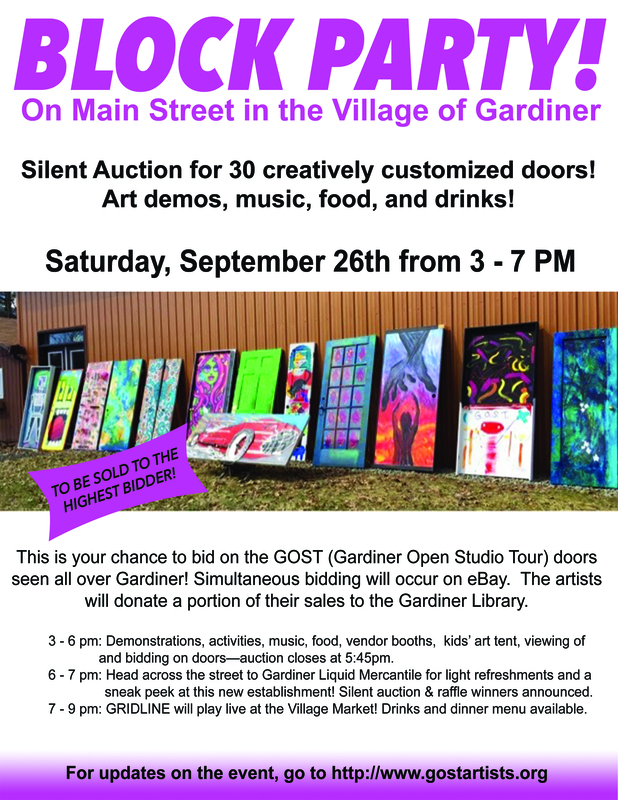 Well, the tour is once again coming on Columbus Day Weekend, and to get ready, GOST and the Village of Gardiner are hosting a Block Party, where you can bid on and win your favorite GOST Artist door! There will also be fabulous drinks, live music and fun activities. Please join us! 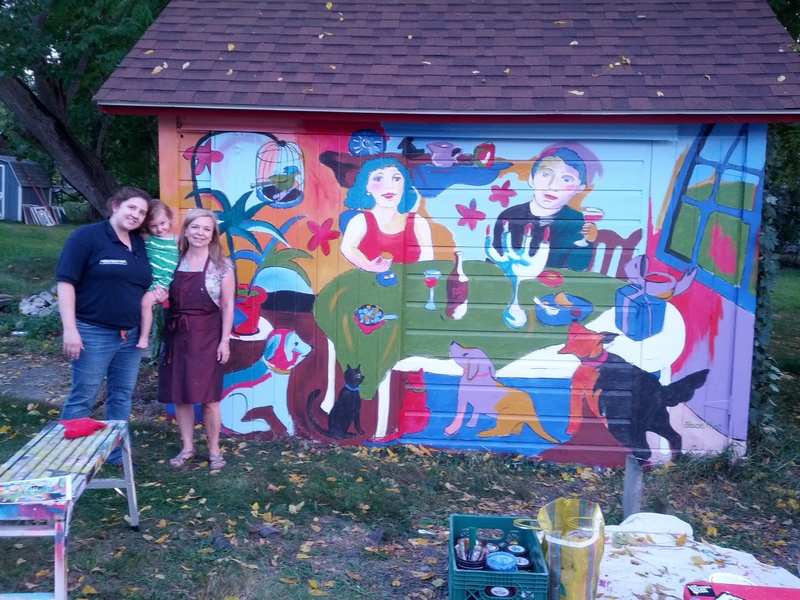 While you are in Gardiner, check out all three murals painted by Lady Pink, Annie O'Neil, and me. Both sides of my "Woman and Patterns" door, which was great fun to paint! I love making turquoise hair and squiggly patterns. 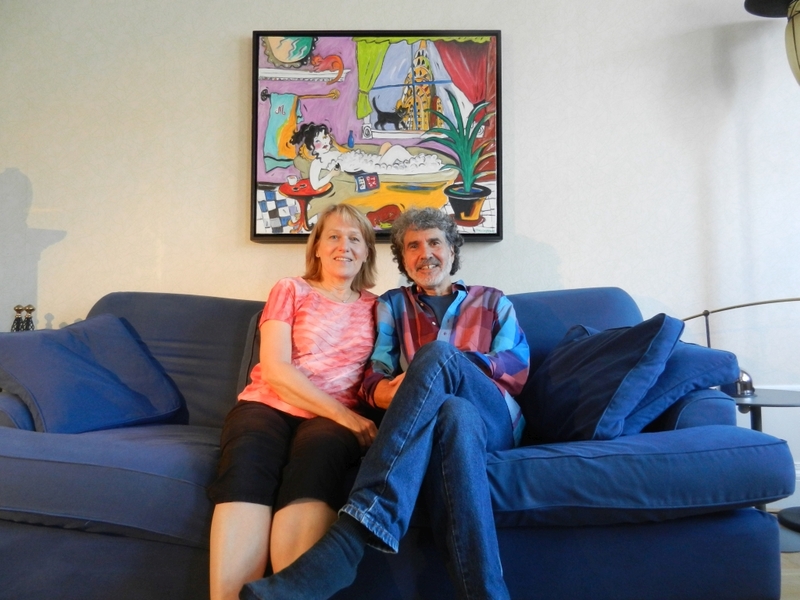 It was really fun to receive this photo from my friends Rich and Siv sitting in a favorite spot at home in Stockholm, Sweden, with my painting "Chrylser Building". Thanks, and enjoy these days of summer as they turn into autumn!